Curious to know about some stretches you can do at your desk? If you find yourself sitting behind a desk all day, you may notice aches and pains creeping up. Staying right where you are, there are some easy and simple exercises that you can do to help eliminate aches and pains and also help prevent them from turning into more serious issues. The health risks of sedentary work include: shoulder, back and neck pain, carpal tunnel, obesity, musculoskeletal disorders, tennis elbow, aches, pains and more. Combined with repetitive tasks, such as those required at a computer, it can increase the risk of injuries and pain. 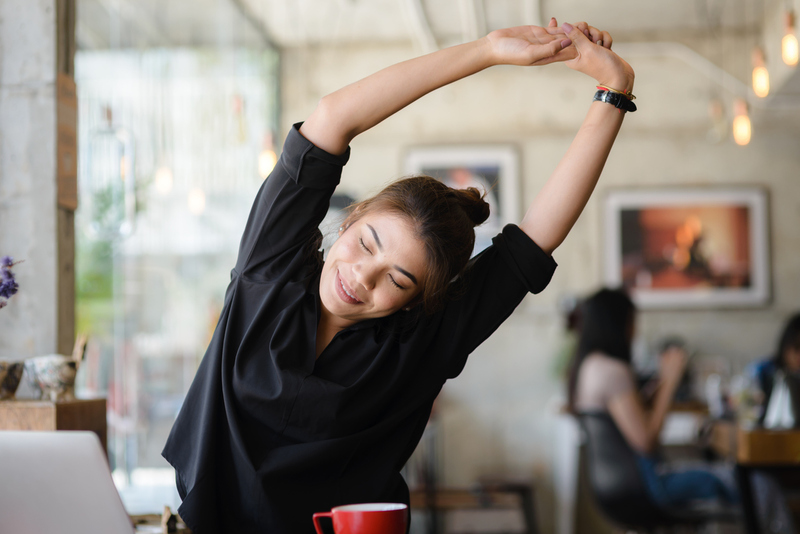 Stretching is a simple and easy thing you can do almost anytime from anywhere to help make small improvements to your health. Benefits of stretching include: increased blood flow and oxygenation, improved flexibility, range of motion, improved posture, stress relief, it calms the mind, can prevent back problems and improves sports performance. Many HR departments and companies will encourage employees to use ergonomic equipment. If yours does, this is a great route to go to help improve your health and not let your desk job take a toll on your health. In the meantime, here are some other things you can do — simple stretches you can do at your desk. Sitting in your chair, cross your left leg over the right, place the right arm over the left knee and the left hand on the back of your chair. Gently twist toward your left arm, hold for 20 seconds. Release and repeat on the opposite side. Sitting in your chair, lift your right arm straight up toward the sky and gently lean to the left, keeping your shoulders in the same plane as your hips. Release and repeat on the opposite side. Sitting at your desk, extend your arms straight out in front of you. Make a fist with each hand. Rotate your fists in and then out several times, stretching your wrists. If a workplace injury is keeping you from living pain free, contact the physical therapy team at Above and Beyond Physical Therapy for an evaluation today. We have partnered with LOVITTE & TOUCHE to help control and reduce workers compensation claims by offering CRT Isokinetic Strength and Agility Evaluations. We also offer Functional Capacity Evaluations (FCEs) at both of our locations. Call today to schedule. © Above & Beyond Physical Therapy 2019. All rights reserved.